Sturmabteilung - TerritorioScuola Enhanced Wiki Alfa - Enhanced Search with WikiPedia Using Robots to display related resources from the web to all WikiPedia words (Video/Audio, .doc, ,pdf, .ppt, maps, edu, .html). For the assault detachments of the German Army during World War I, see Stormtrooper. For the youth groups, see Jungsturm. 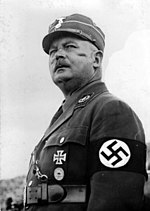 The Sturmabteilung (SA; German pronunciation: [ˈʃtʊɐ̯mʔapˌtaɪlʊŋ] ( listen)), literally Storm Detachment, was the Nazi Party's original paramilitary. It played a significant role in Adolf Hitler's rise to power in the 1920s and 1930s. 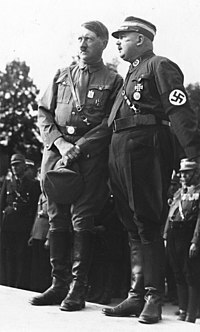 Its primary purposes were providing protection for Nazi rallies and assemblies, disrupting the meetings of opposing parties, fighting against the paramilitary units of the opposing parties, especially the Red Front Fighters League (Rotfrontkämpferbund) of the Communist Party of Germany (KPD), and intimidating Romanis, trade unionists, and, especially, Jews – for instance, during the Nazi boycott of Jewish businesses.